The Winning Wizards tried to find the formula for eternal life. Click here to play! The extra 50 years they'd earned from the whole eternal life fiasco got used up in prison, sadly. Now, the wizards just want to retire in luxury, so they are working on creating a Golden Goose as a sort of magical pension. Unfortunately, the wizards were never too good at creating life, so instead they've gone back to their old plans and just adapted their Winning Wizards slots machine to feature a magical Golden Goose bonus feature. It all seems to be working fine, but the wizards need to go out for a bit. Could you guard the machine for them? You won't take it with you or play it in order to win the jackpot and Golden Goose bonuses for yourself will you? Hop onto to Golden Goose - Winning Wizard slots if you would like to try for the jackpot before the wizards get back and turn you into a newt for your insolence. Be quick about it, as they said they were only going to the pub for a bit! The Crystal Ball symbol is a scatter symbol that pays out on the total bet when 3 or more land on the reels. 3 symbols payout 3 times the bet, 4 symbols payout 25 times the bet, and 5 symbols payout 100 times the bet. The Wizard symbol is wild and can substitute for any symbol other than the scatter symbol. It also doubles the value of combinations that it completes as a substitute. 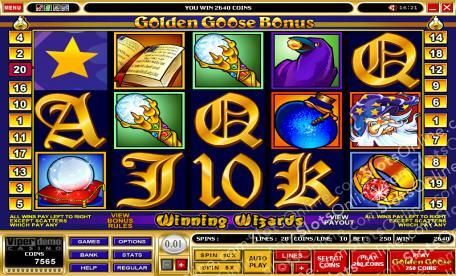 The 4 Golden Goose bonus games must first be activated by playing the Golden Goose bet, after which they can be randomly triggered after the reels have stopped. First of the games is the Golden Egg Bonus. This awards the player a golden egg with a random prize value. Another game is the Golden Reels Bonus. This has players choosing an egg from every reel, with each egg revealing a bonus prize amount. The third game to play is the Money or the Egg Bonus. This bonus gives the player a choice between the Money, awarding a random prize value, or the Egg, awarding a random number of free spins and a random prize multiplier for the duration of those free spins. The last game is the Pick a Card Bonus. In this bonus, the player chooses 1 of the 5 cards, winning up to 11 free spins with a 6 times prize multiplier. Autoplay can be set for up to 500 spins. It may also be set to stop on a win of a certain amount. The side bet will always be made in autospin.